SEM micrograph of S. pneumoniae. 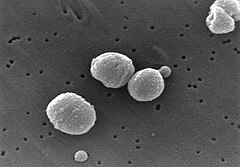 Streptococcus pneumoniae, or pneumococcus, is a gram-positive, alpha-hemolytic diplococcus aerotolerant anaerobe and a member of the genus Streptococcus. An important human pathogen, S. pneumoniae was recognized as a major cause of pneumonia in the late 19th century and is the subject of many humoral immunity studies. This page was last changed on 5 March 2016, at 21:51.